Unpublished photograph of the short-lived second Britannia Circus in Floriana. Early in 1919, almost a hundred years ago, the British authorities demo­lished a fine building erected in Floriana shortly earlier, to make way for the King George V Merchant Seamen’s Memorial Hospital. A worthy initiative, no doubt, but that philanthropy obliterated a watershed memory of Maltese entrepreneurship, unpicked some imperialist social engineering and destroyed an attractive sample of architectural expression. The thousands of British and colonial soldiers and sailors swarming all over Malta in the late Victorian era needed to be entertained, and various initiatives, official or otherwise, sprung up all over the island to keep the personnel amused and happy. 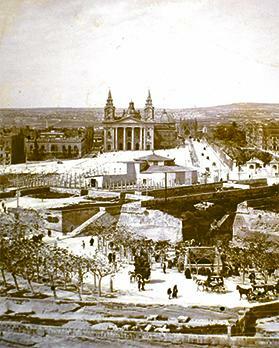 To mention the mentionables, the Marsa sports grounds and clubs, the military gymnasium, which later turned into the Vernon Club (now the Central Bank), the Services’ amateur dramatic companies, the Union Club and the Opera House – and the unmentionables: Strada Stretta the Gut, Balzunetta in Floriana, the Senglea and Gżira waterfronts. When on land, servicemen found plenty of spare time on their hands. Never let ennui turn into the enemy of empire. Maltese entrepreneurs proved more than willing to lend a hand, and rake in some returns on the side. The first public cinema had opened in Paris in December 1895. In January 1897, Mr Harding was already screening films for public viewing in Valletta in Harding’s Cinematograph and Bioscope, overlooking the Main Guard, where Marks and Spencer’s now stands. From then on, an eruption of cinema halls in Valletta and the towns that could not be contained. The first Britannia Circus – the round building in front of St Publius church – was dismantled after just six years in 1905 to make way for the new tramway. Sensing the potential of the new entertainment, Joseph P.P. Bonnici too jumped on the bandwagon, targeting the armed forces with a venue inten­ded specifically for British servicemen and British tastes. His innovative concept envisaged a large multi-function venue, suitable for indoor sports, cinema, circus acts, spectacles, variety and other cognate uses. The idea of the Britannia Circus took shape, and it opened to the public by 1899, though Bonnici had earlier already run a circus in a canvas tent. Obviously, the promoter chose that spot outside Porta Reale for its strategic position: on the doorstep of the populous Floriana barracks and married quarters. So far I have been unable to give Mr Bonnici a broader profile; he does not seem to figure in the lists of prominent businessmen in Malta. His middle initials may stand for Peter Paul, and he lived at 77, Christopher Street, Valletta. He negotiated with government the concession of a large tract of public land, roughly where the underground Floriana car park now stands. That no-man’s land between Porta Reale and the Granaries had remained quite undeveloped, apart from some im­pressive lines of Hospitaller bastions which the British military considered useless for modern warfare and pounded into the ground, with matter-of-fact élan and philistine nonchalance. Bonnici would have found it easy to convince the British authorities to lease him the land: his request answered to the armed forces’ voracious, and insatiable, appetite for amusement and then some more. The first structure was, unusually for Malta, almost entirely in wood, which suggests that permanence was not high on the list of priorities. But the project hardly lacked ambition: an oval building, 156 feet at its widest, and 100 feet at its narrowest, with two rows of boxes, 21 seats to each row, a parterre, a grand tier and four large stage boxes, designed to accommodate 4,000 people. Not surprisingly, the owner named his money-spinning hope ‘The Britannia Circus’ – circus has today come to be associated with performing animals, clowns, magicians and acrobats, but in Victorian times the word also stood for any circular or oval building or space – see Dingli Circus. Bonnici also had a traditional circus in mind, with performing animals. A petition by him refers to his contract with the Circo Equestre Excelsior of Signor Quintini, run by Alfredo Leonardi. “In view of great financial difficulties and of utter incapacity for business, Mr Bonnici cannot be considered a satisfactory undertaker, and I strongly doubt whether under the proposed conditions he will ever succeed in erecting a decent circus. The rotten material of the previous circus, which is mortgaged, will un­doubtedly be used for the proposed erection, and the new circus will likewise have to be mortgaged as soon as the work will be taken in hand”. The building catered mainly for theatre, vaudeville, circus shows and cinema, together with musical performances and dances, but it also proved popular for indoor sports, like boxing, a favourite with the armed forces – the inter-Services tournaments at the turn of the century were held there. Occasional references throw light on its earlier lifespan. The Daily Malta Chronicle reported that, on the occasion of the visit to the island by the Duke and Duchess of Cornwall at the end of March 1901, the British authorities had commandeered many thousands of schoolchildren to Floriana to greet them. The girls met at the Floriana government school while the boys assembled “at the Britannia Circus, kindly put at their disposal by the managing directors”. The organisers gave every child a Union Jack or a Maltese flag to wave. With the patriotic welcome over, the boys again repaired to the Britannia Circus “where no end of good things had been provided, in the way of refreshment, by the government, and which the youngsters lost no time in demolishing”. Colonial largesse. You forfeit your right to nationhood, but in return you get a free sandwich and a fizzy lemonade, so long as you wave the flag of those who own you, all the way from famine to serfdom. Portrait of the Godwin H. Galizia, the architect of the beautiful second Britannia Circus in Floriana. Courtesy of Professor Mary Darmanin. I know of no close-up photo of the façade of that first building, but the large wooden pavilion does appear as a detail in some panoramic views of Floriana, both from the Porta Reale angle, and from the Grand Harbour. Then came 1905, and the first Britannia Circus, barely six years old, had to be dismantled, as it lay bang in the centre of the projected new tramway with its terminus outside Porta Reale. We do not know how the owner took the news of his eviction, and whether he put up any show of resistance. We do know he had to scout around for a new site, and homed on another Floriana zone, overlooking Grand Harbour, in the area known as Kalkara Gate, after the Order’s principal lime kiln – la calcara della Sacra Religione. This time his plans aimed higher on the ambitions scale: Starting as impresario of a canvas tent, Bonnici then thought of a second wooden structure, but eventually graduated to a large stone multifunction building, left in the hands of a trendy and competent architect. 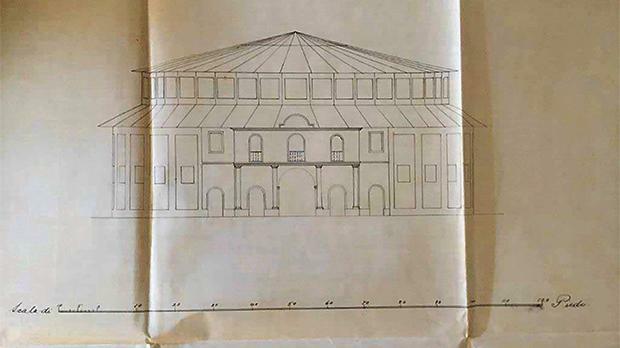 The government files indicate that Bonnici had at first retained the services of the architect Annibale Lupi, and his rough sketches for plan and elevation survive. Lupi is remembered for redesigning the old dome of the parish church of Żejtun and Palazzo Parisio in Naxxar. But later the files introduce the name of a new perit: Godwin Herbert Galizia, the youngest son of the great and prolific Victorian architect Emanuele Luigi. Art historians have rather overlooked Galizia Jr – he is usually associated with only two important buildings: the parish churches of St Gregory in Sliema and that of St Peter in Birżebbugia, both in revival Romanesque style, and some vanity burials in his father’s Addolorata cemetery. Otherwise historians have forgotten him almost entirely – he does not even claim a small footnote in textbooks, biographi­cal dictionaries and encyclopaedias. Unjustly so. Galizia Jr proves to be a fine architect, with an eye for historicist idiom and a rock-solid decorative craft. He was born in Valletta on April 12, 1880, and died aged 63 in Sliema on February 11, 1944. Just before he pass­ed away, he co-authored with law professor Giuseppe E. De Giorgio a handbook on the War Damage Ordinance. Galizia came up with a fine design – sombre, well-proportioned, contemporary and functional – not too Victorian, not wantonly eclectic, classicising but nowhere near textbook neo-classic. Though he reserved his best efforts for the façade elevation in good opera-house expression, he did not skimp on the elliptical sides. I would not be surprised to discover that Galizia Jr also authored the large, elegant but short-lived Downs and Johnson’s Motor Garage next to the Porta Reale, now also demolished. 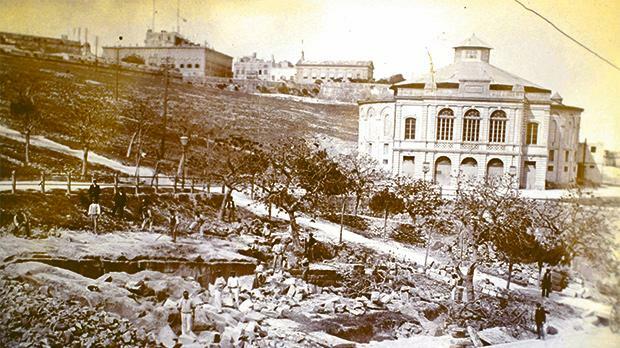 The building of the second Britannia Circus closer to Grand Harbour en­countered several problems, many of an administrative nature, but also construction difficulties. Among others, the chosen area was mostly formed of compacted rubble, 22 feet deep, discarded from some previous major construction project, before bedrock for the foundations could be reached. This accumulated detritus was then thought to have been from the building of the new Valletta after the Great Siege of 1565. No archaeological and stratigraphic investigations seem to have been undertaken, and what could have been a major historical repository ended carted away and dumped. 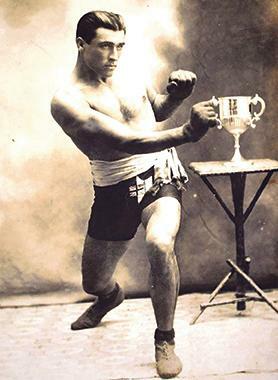 Portrait of Paolo Cauchi, the first Maltese boxing champion. Most professional and amateur boxing tournaments were held in the Britannia Circus in Floriana. The Santu Spirtu National Archives in Rabat house many files related to the two Britannia Circus projects – bureaucracy at its most relentless. Minutes, petitions, drafts of contracts, interminable paper shuffles, public health concerns: were there enough latrines with ‘constant flushing appliances’ and ‘self-lifting’ seats? Would the space for the circus animals be properly insulated from the rest of the building? How to guarantee that no intoxicating beverages would find their way inside unless licensed? The new, more elegant and permanent theatre, circus and cinema went into full swing, specialising in indoor sports and films for the Services – silent films almost invariably required some live music to create the right atmosphere. Many of the highly competitive and popular boxing matches and tournaments of the times, reserved for British servicemen only, were battered out in that venue. An old Floriana resident described it as “a most popular and fascinating theatre, known before the First World War as il Circolo Britannia”. The theatre did not advertise widely, probably because it believed it could survive on its captive audience: the huge numbers of British officers, soldiers and sailors and their families stationed in or passing through Malta. It is only on special occasions that references to that early cinema slip into the press. One such was the catastrophic earthquake of Messina of December 28, 1908, which devastated the east coast of Sicily and Reggio Calabria, killing anything from 60,000 to 200,000 people – estimates vary. An upsurge of solidarity gripped Europe, and everyone vied with everyone else to be seen to be adequately generous. The Britannia cinema joined in, and in February the following year advertised a grand charity event in aid of the victims. This would consist in a two-hour cine spectacular, running to 1,500 metres of film, documenting the terrible disaster, shot on site in the immediate aftermath. The film featured brave blue-jackets and British sailors saving lives, the discovery of survivors after an eight-day ordeal, railway cars violently hurled in the sea and other dramatic and morbid scenes. For this special occasion, boxes cost 2s. 6d., pit stalls 3d., and seats in the gallery one penny less. Operettas formed part of its repertoire. Musical director Maestro Orlando Crescimanno, of Italian descent, the son of an architect and possibly related to the renowned exiled jurist Nicola Crescimanno, staged operettas in the Teatro Circolo Britannia of Floriana. Photographs of this rather ephemeral second building proved difficult to come by but I found a splendid one of the harmonious façade, which also shows extensive excavation works being carried out in front of the cine­ma. Richard Ellis recorded the interior in two negatives, unfortunately damaged by water infiltration. One has a person sitting in the front rows, possibly the owner Joseph P.P. Bonnici (or was he still Giu­sep­pe? ), and the rather Spartan set-up of the furnishings and interior decor. Multiple adverts by the main brewers who competed in Malta to quench the thirst of servicemen line the boxes: Simonds, Ind Coope & Co, Burtons, and Younger & Co. I can see why the fixation of the authorities on toilets. This impressive building had a short future to look forward to. At the outbreak of the war in 1914, the military took it over for the storage of forage for the cavalry regiments. The contract of encroachment entitled the authorities to terminate possession at any moment, for any reason and without compensation. A hospital in memory of the merchant seamen who died in World War I had to be built next to King Edward VII Merchant Sailors’ Rest, at the foot of Crucifix Hill, Floriana, and eyes fell on the site then occupied by the disused Britannia Circus. The authorities repossessed it, demolished the theatre after barely 14 years of existence, and replaced it with the King George V hospital. Lady Mary Ethel Methuen, the Governor’s wife, laid down the cornerstone on March 27, 1919, but progress proved difficult because of the depth of the rubble to be excavated before the foundations could be rested on the rock surface. The cost of the hospital for 33 beds ran to £16,000, but finally, on November 20, 1922, Governor Lord Plumer formally received the silver key that opened the doors to the new hospital. Everyone could be admitted, provided they were British. After being extensively damaged in World War II and closed in 1967, nine years later it changed destination once more, becoming Boffa Hospital. All my gratitude to Leonard Callus at the National Archives, Maroma Camilleri at the National Library, Dr Peter Caruana Galizia, Prof. Mary Darmanin, Dr Stephen C. Spiteri and Dr Conrad Thake for their unstinting help. Drawing of the elevation of the proposed new Britannia Circus by Architect Annibale Lupi. Courtesy of the National Archives, CSG 01/653/1903.